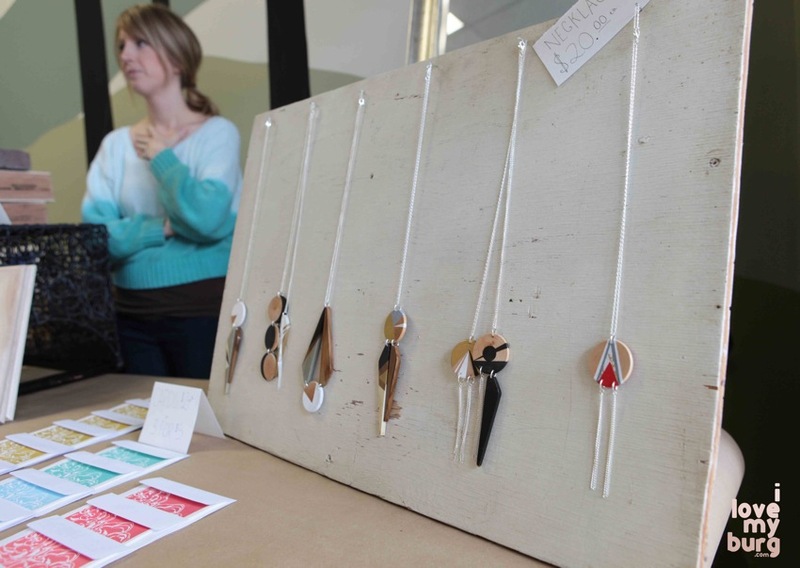 painting the town green and red: holiday art market 2013. | i love my burg. 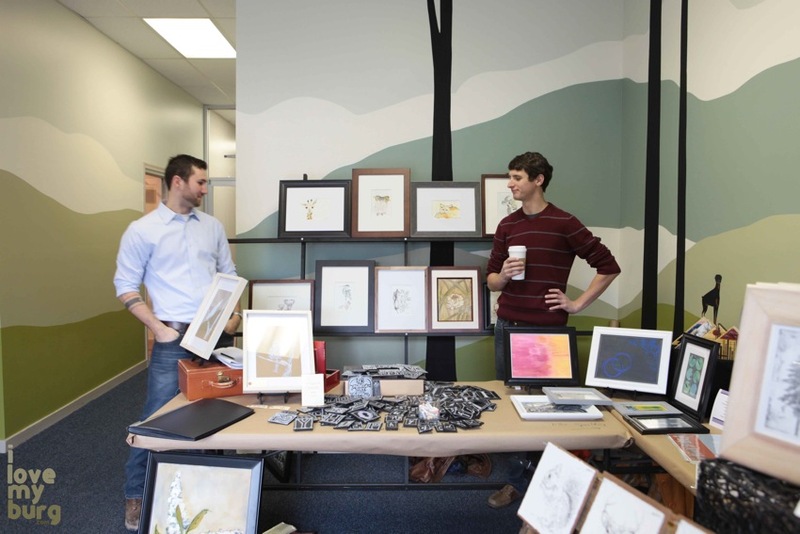 painting the town green and red: holiday art market 2013. Valerie Smith is an industrious woman. Maybe it comes from having taught public school art, where your budget is like 17 cents a kid and you have to constantly make something from nothing, find ways to scrape together materials, and figure out how to get kids to complete projects when you only see them once or twice a week. Valerie just finds a way. I can picture her down there at Larkin Arts. “Hey, Val, can I teach a children’s class here this summer?” “Yes.” And off she goes to make it happen. And then she scurries off, gathering tables and linens and chairs, lights and extension cords, nails and hammers and paint. Wine glasses and cork screws. She just finds a way. 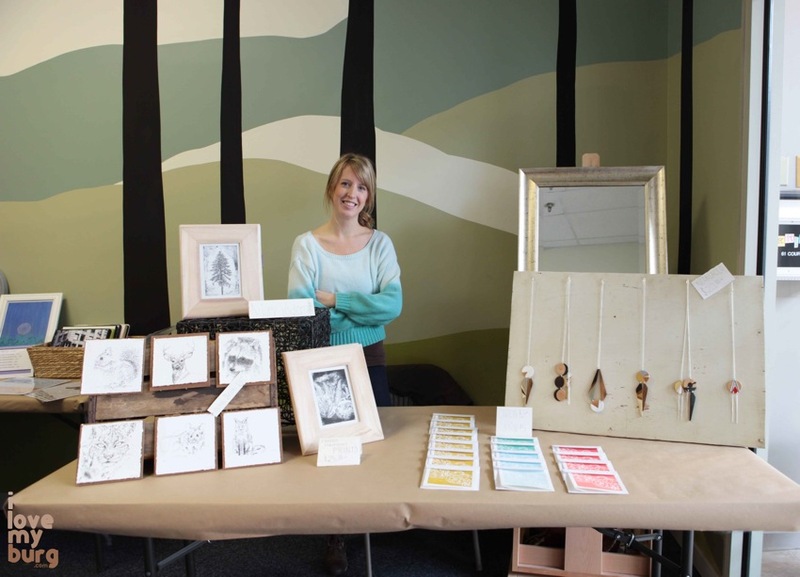 Last Saturday she found a way to welcome twelve local artists and their wares into her store so they could set up and sell their goods at the first of two Holiday Art Markets this year. In warmer weather, the art markets take place outside on the sidewalk there, but knowing her artists and patrons would be more comfortable inside on that brisk morning, she practically gutted and rearranged several rooms to accommodate everyone. There were three in the lobby, four or five in the gallery, and six-ish in the classroom. I happened to have a little break from my kiddos that day, so I was really excited to get down there and help out. 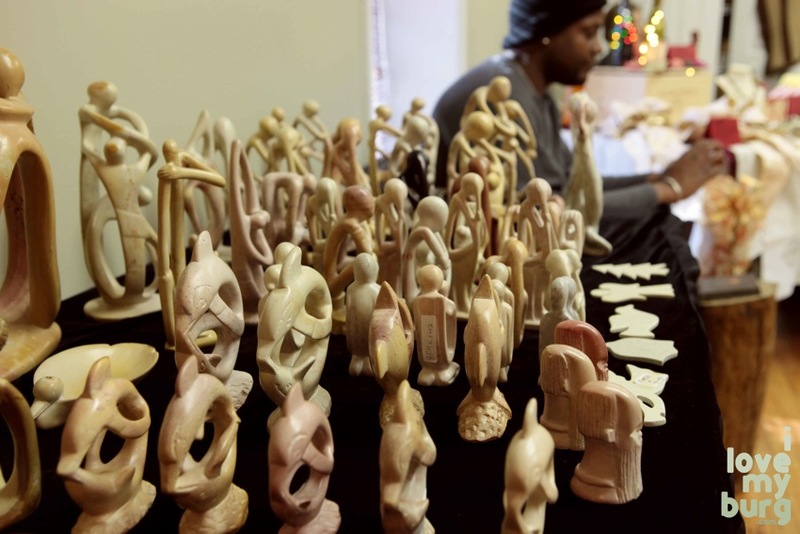 Once everyone was set up and the market officially opened, dozens of customers strolled through… enjoying light snacks, pouring over beautiful hand-crafted items, and purchasing unique gifts for their loved ones. Here’s a run down of everyone who participated. 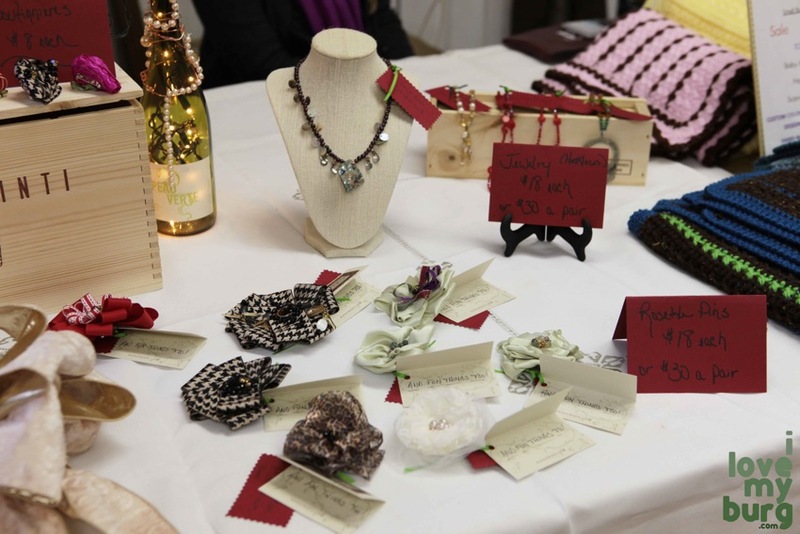 Chris Carter boasted a lovely display of blankets, hats, bows, and jewelry, and Denise Allen’s paper items rounded out the room. 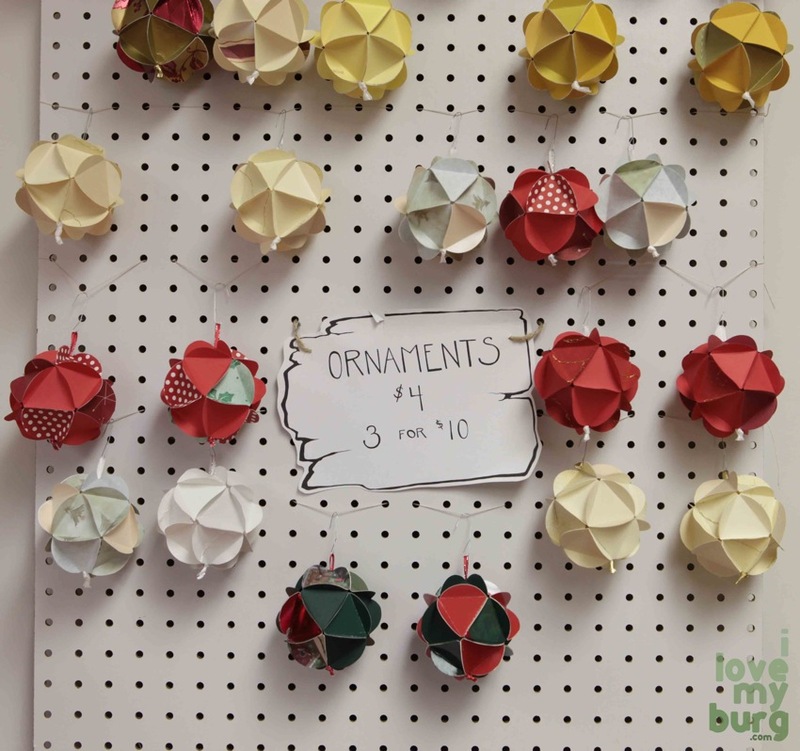 She had cards, stationery, coloring books, ornaments, and star-shaped crayons made from melted down crayon scraps. 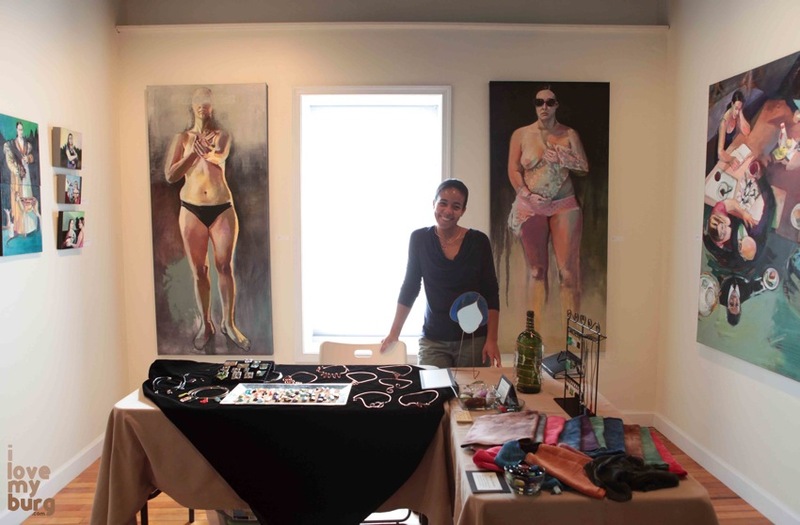 In the gallery area, Jauan Brooks displayed a beautiful assortment of jewelry and textiles, and Kelley Shradley-Horst sold her found art and eclectic jewelry. In the lobby, you could see the impressive selection offered by Hannah Johnson, including some really amazing framed drawings. 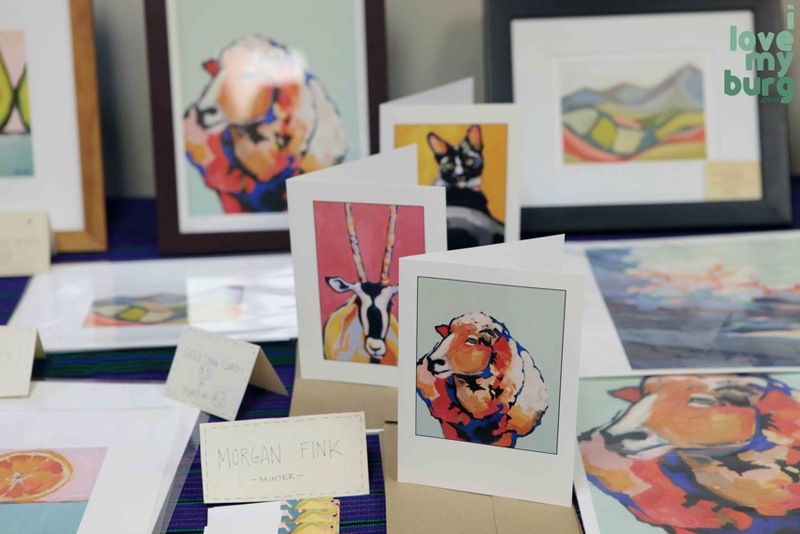 Ashley Miller’s paintings brightened up the space, and Mary Yoder had some lovely sketches, cards, and necklaces for sale. Brandy and Ben shared a table in one of the classrooms. 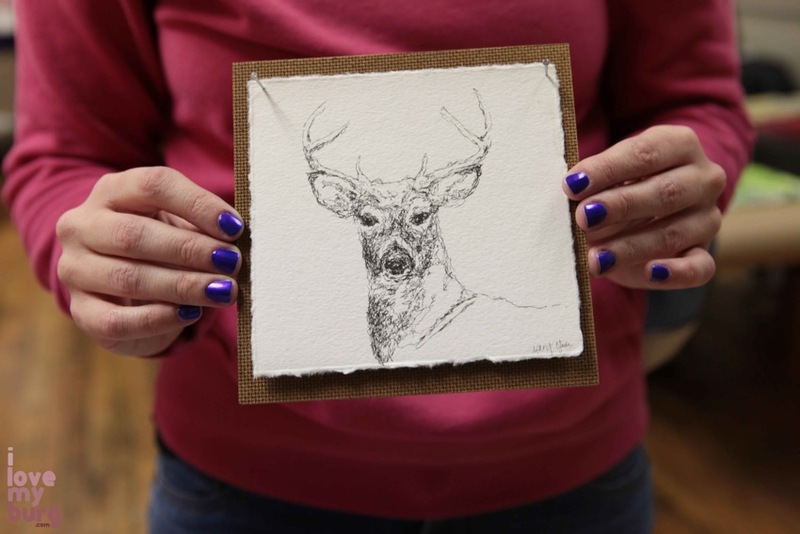 Brandy sold her original tee shirts to raise money for Art Lotto 2014 and also offered gift certificates for photography sessions. She’s done A LOT of sessions in the past few, and her web site is all up-to-date, so please go there and see her recent work! Ben’s upcycled wine bottles are really cool. He takes wine bottles, or other glass bottles, and cuts them into a new shape for a new purpose, sands it down, and even etches. He specializes in wedding centerpieces. He also had some paracord items available. Of course, Brandy and Ben were positioned next to the Rosenwassers — Bruce and Leah. Being next to their table is like having to sing after Streisand or Sinatra. Their work just always makes the room explode. 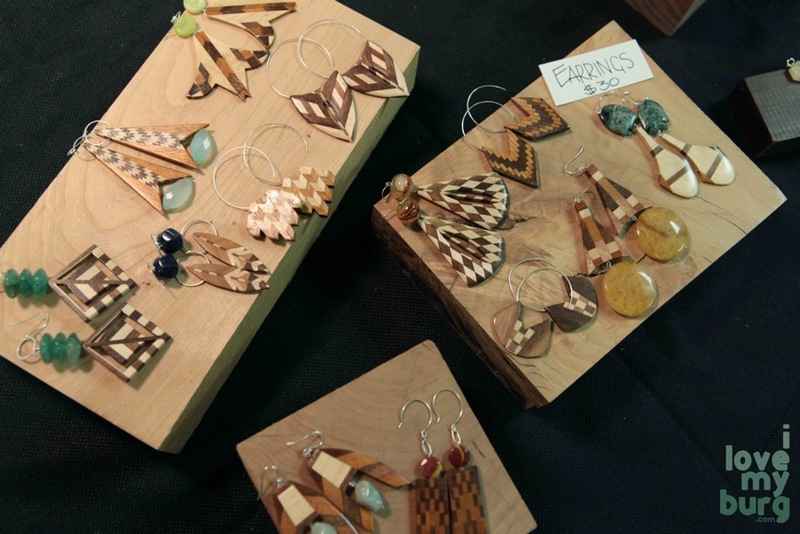 Leah makes absolutely gorgeous jewelry, and Bruce makes some of the wooden pieces she uses. 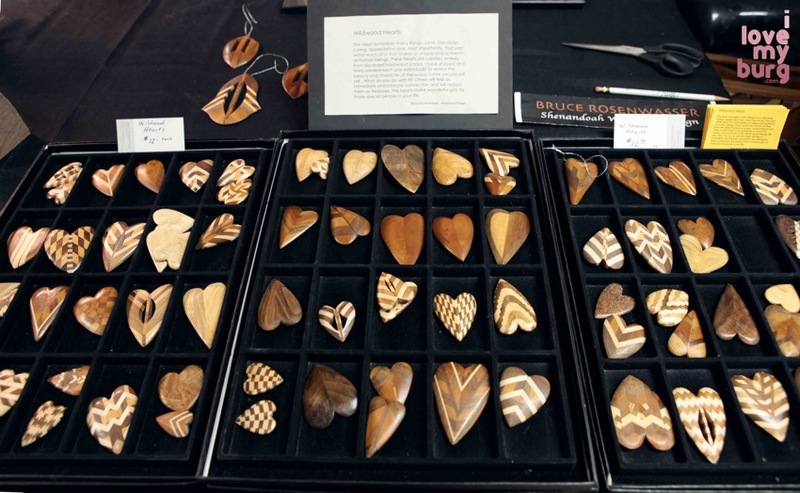 Bruce also makes a variety of reclaimed wood items — mirrors, sculptures, collages, trinkets. Emily Rees’ paintings were instantly recognizable. So much color and contrast and texture, really gorgeous and timeless work. 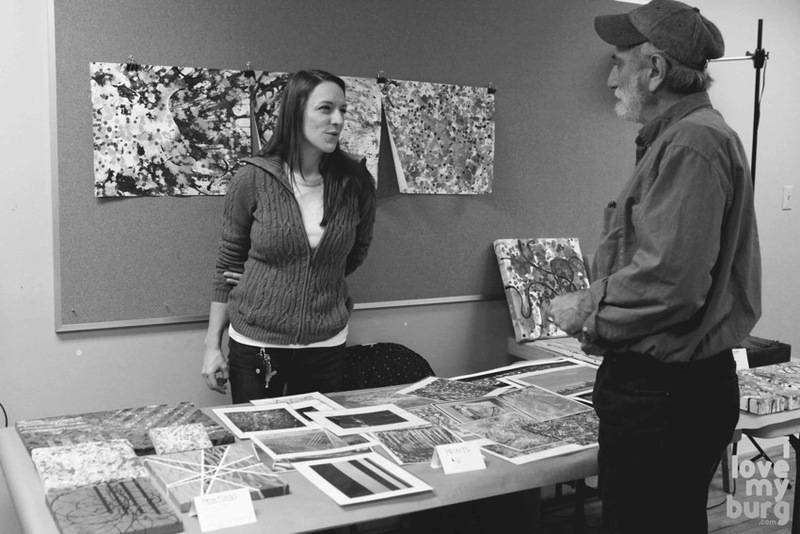 Next to her was Morgan Fink, whose bright prints happied up the place. 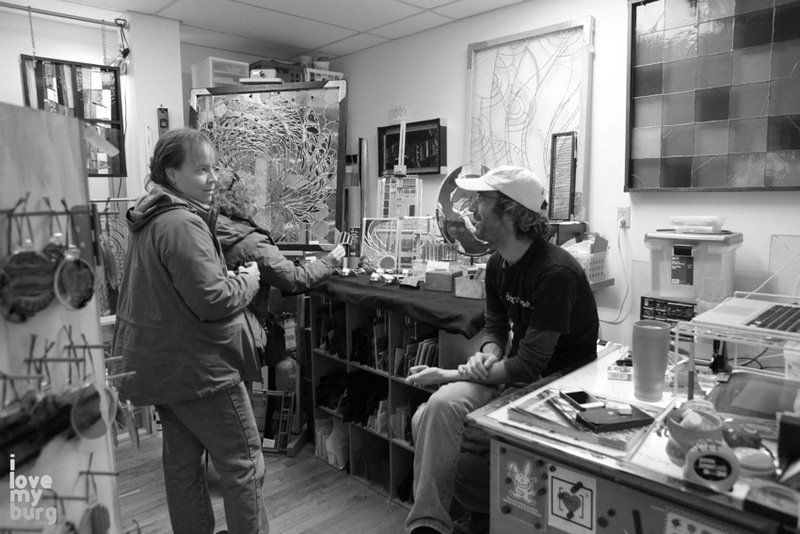 And of course, Zac Naftziger was working in his studio there, and we could hear the “wow’s” in the next room! 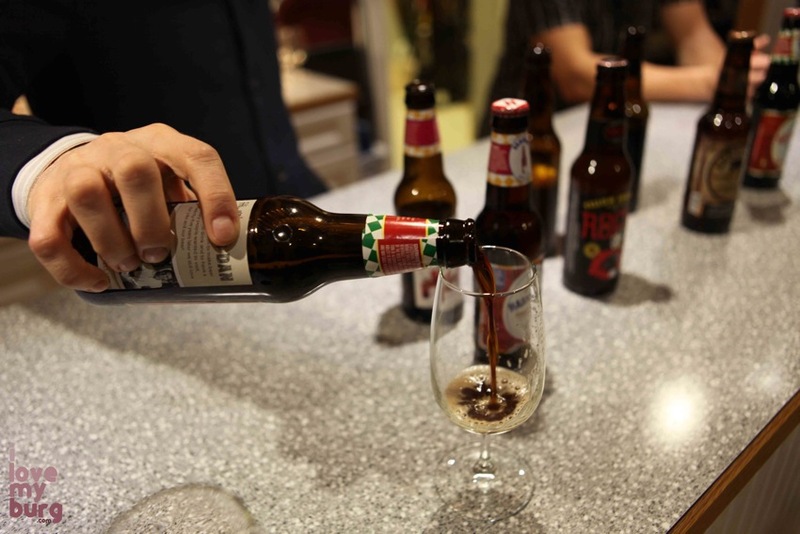 After getting there and getting set up and helping some customers, Brandy and I decided to slip out to the beer tasting at Downtown Wine and Gourmet. Also, I had to pee, and I didn’t feel I could concentrate well enough to shop until I was… more comfortable. So Ben manned the table while we scooted out for a few minutes. 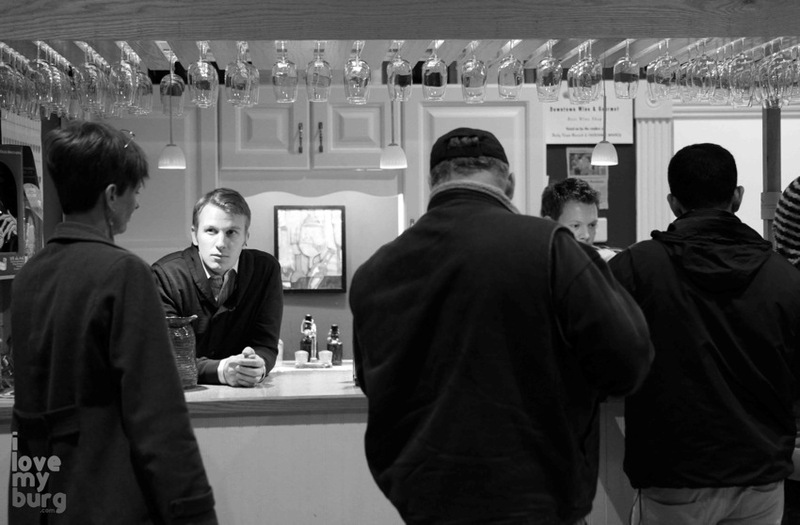 Of course, once at the wine shop, we told everyone we saw about the art market. 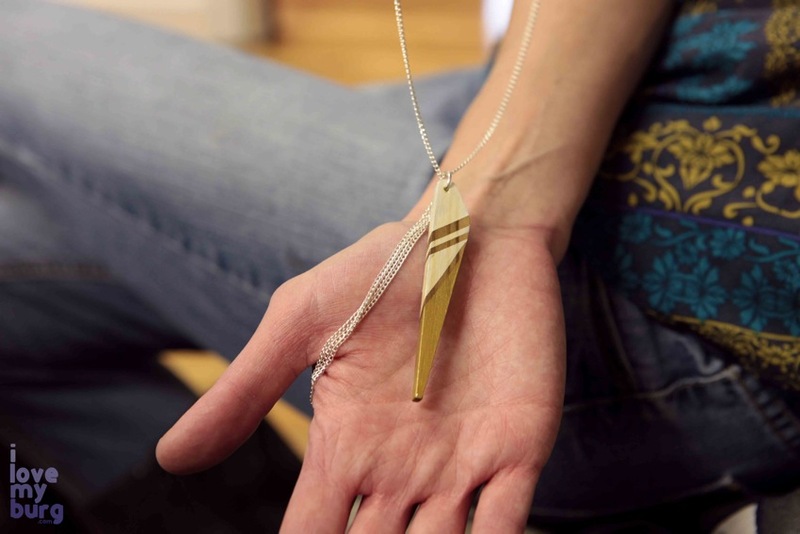 Back at Larkin, I was feeling better and could take my time to browse, and I decided on one of Mary Yoder’s necklaces. Brandy picked out one of her sketches. 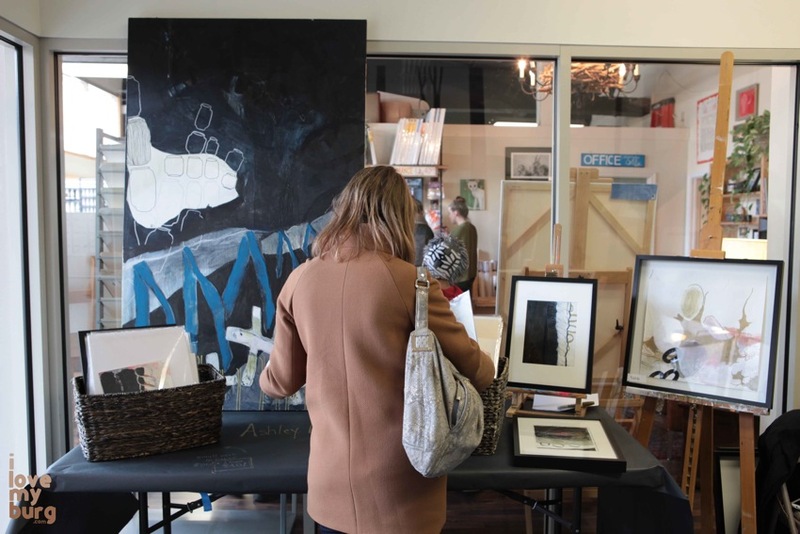 If you missed the Holiday Art Market, don’t fret. There’s another one! Yep, that’s right! 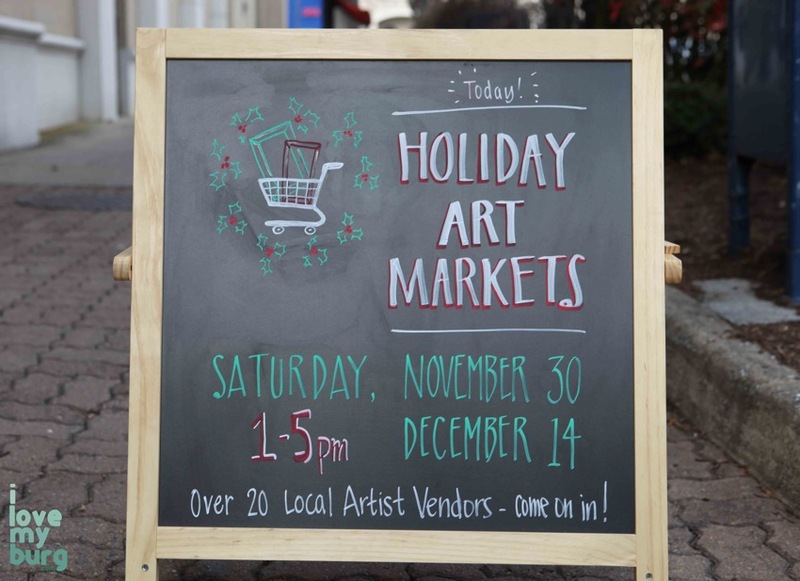 On Saturday, December 14, you can come on down to Larkin Arts and do some more shopping. And TONIGHT at Larkin, come to the Wonderkittens Artist/Child Portrait Show! Starts at 5pm and features TWO Arteries (live painting, all can participate) and the music of Nick Melas! In fact, you might as well just bring a cot to Larkin for the next couple weeks and camp out. Valerie can probably find a way. 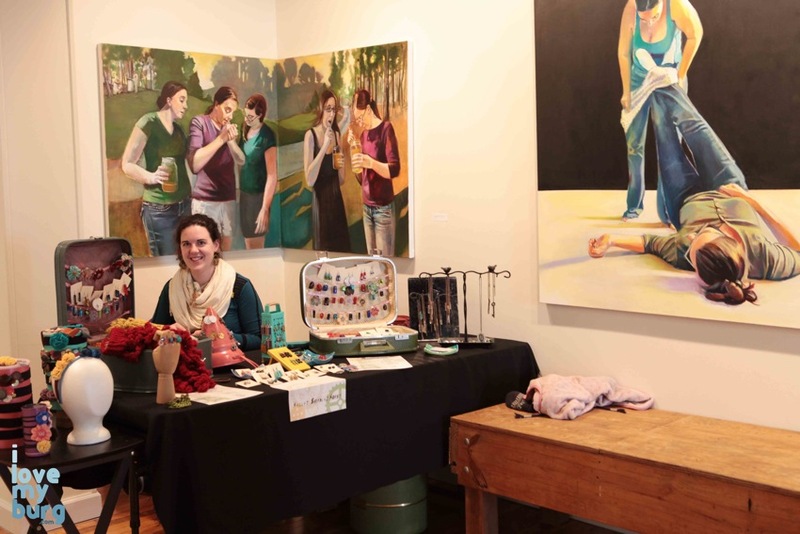 This entry was posted in events, retail and tagged art, art sale, Artery, Brandy Somers, crafts, Denise Allen, Harrisonburg Virginia, Katie Mitchell, Larkin Arts, local art by junebug. Bookmark the permalink. So cool! We live in a great place. Thanks for reminding us. Thanks guys, great piece and stellar photos as usual!